A woodworking tool with the side edges bevelled. It is used for general cutting. A woodworking chisel made out of solid cast steel. Normally used for heavier work. The handle fits into the cast socket and quite often has a ferule or button on the end. A woodworking chisel with bevelled edges. The length of the blade when new is a lot longer than other chisels. It is a bench tool. Socket Chisel The above tool is also a chisel that instead of having a pointed tang that fits into a hole in the handle, it has a socket, and the handle fits into that. This makes the handle a lot less prone to splitting. These chisels have the edges bevelled and because of this they are weaker than the equivalent width firmer chisel, framing chisel and mortise chisel. They require careful handling. They do in general produce better work. The chisel above is typical of the products of modern manufacturers. It has a plastic handle which in most cases is a good thing as modern plastics handles last far longer wooden ones. The chisel here is being used for Paringthe bottom of a trench. That is the flat face of the chisel is levelling out the bottom of a recess. A common operation. Unfortunately with this tool then it can only do this type of work if the trench is no more than 4" long! To give the manufacturer his due, bevelled edged chisels are not as robust as some of the other patterns and by making them shorter they are stiffer and can take more hard belts with a hammer, where a longer one would be springy with lots of give. 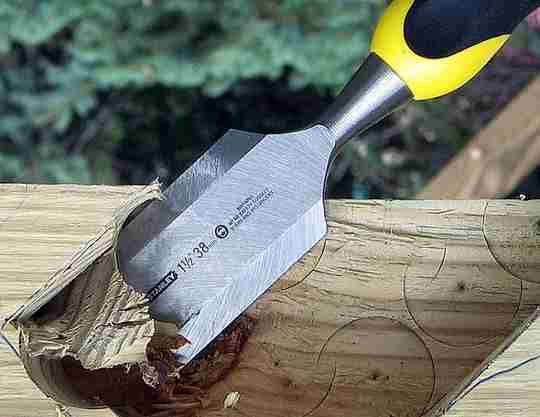 Paring Chisel. So "when I were a lad" the bench hand joiners that I served my time with all had this type of chisel. In the 32mm (1-1/14") width they would be about 300 to 350mm (12 to 14") long. They normally would be of excellent steel with boxwood handles. They were used for what we see the tool above being used for. Cleaning out, levelling off and tidying up the bottoms of the trenches in stair strings or trimming wide tenons etc. Top image. A 25mm bevel edge chisel with a standard wooden handle. Bottom image, Another socketed bevel edge chisel with a wooden handle. The standard handle that fits over a tang in the chisel always has a metal ferrule at the joint to stop the wood splitting. In the example top-above it also has another ferrule at the end. The lower example is once again a socket design and the body of the chisel shows a modern trend that is to make the bevels steeper than the older versions, thereby adding a bit more strength and stiffness.